Theodor Förster (1910–1974) developed a phenomenological theory of nonradiative resonance energy transfer which proved to be transformative in the fields of chemistry, biochemistry, and biology. 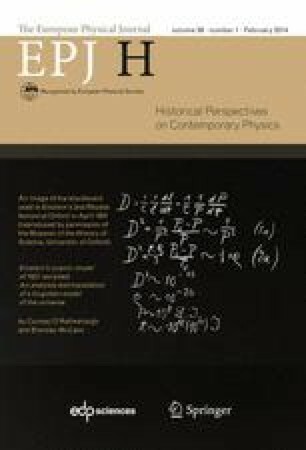 This paper explores the experimental and the theoretical antecedents of Förster’s theory of resonance energy transfer (FRET). Early studies of sensitized fluorescence, fluorescence depolarization, and photosynthesis demonstrated the phenomena of long-range energy transfer. At the same time physicists developed theoretical models which contained common physical mechanisms and parameters: oscillating dipoles as models for the atoms or molecules, dipole-dipole coupling for the interaction, and a distance R 0 that is optimal for resonance energy transfer. Early theories predicted R 0 that was too large as compared to experiments. Finally, in 1946 Förster developed a classical theory and in 1948 he developed a quantum mechanical theory; both theories predicted an inverse sixth power dependence of the rate of energy transfer and a R 0 that agreed with experiments. This paper attempts to determine why Förster succeeded when the other theoreticians failed to develop the correct theory. The putative roles of interdisciplinary education and collaborative research are discussed. Furthermore, I explore the role of science journals and their specific audiences in the popularization of FRET to a broad interdisciplinary community.